As we concluded Gold Coast magazine’s 50th anniversary year in December, we were reminded that over the years Gold Coast and Gulfstream Media Group’s other magazines have become part of the record of an era. You don’t think about that when publishing a story about an event (such as the birth of the Honda Classic as The Jackie Gleason Inverrary Classic in 1972) or an individual, such as the hundreds of profiles we have run over the years, but those stories have legs. It sometimes takes years to recognize that, but it hits home when there is a request for a photo or story that appeared decades ago. You can spend hours just finding the right issue, if it even exists, and more time copying it, sometimes from a bound volume. Case in point: In 1982, the late Gaeton Fonzi wrote a three-part piece on Ken Burnstine. The name may mean little to many people today, but in the 1970s Burnstine was a notorious drug runner, and flamboyant South Florida figure. He was a fast man with his fists and kept lions on his property in the Coral Ridge neighborhood of Fort Lauderdale. He started out straight. He spent three years at the University of Pennsylvania, graduated from Northwestern, and served in the Marine Corps. He became a respected developer in Florida. He built the round Kenann Building at Oakland Park Boulevard and U.S. 1 in Fort Lauderdale. The name was a combination of his name and his wife, Ann. He was also an air racer. His beautiful P-51 fighter of World War II vintage made Gold Coast’s cover in 1974. When he got into financial trouble, Burnstine turned to drug running. Everybody knew he was a crook; he all but admitted it. His planes loaded with dope kept crashing, but it took years for the law to catch up with him. When the feds finally did, he became an informant and was about to bring down dozens of associates when he died in the crash of his P-51 while preparing for an air race in California. At the time there were reports he had faked his death—that the body in the plane was not his and that he had been spotted in Spain and elsewhere. Fonzi’s articles, “Ken Burnstine Is Still Dead,” debunked those theories, but opened a dramatic door, suggesting Burnstine’s plane may have been sabotaged to keep him from testifying in court. Fonzi also revealed that the man had intelligence connections going back to his Marine Corps days, and may have been involved with the CIA in its Latin America machinations even as he was running drugs. Requests for copies of those three issues have been made over the years, and two came within a few months last fall. One was a man working on a book in which Burnstine plays a minor role. The other was from a nephew of a pilot killed while he was working for Burnstine. He had heard about the CIA connection and was hoping to discover his uncle was not a bad guy, but might have been working for the government through Burnstine. Another recent example of the importance of good archives was a request for a copy of a 1976 story we ran on Scotland Cay. Margaret Walker, our associate editor at the time, was friendly with Stan Smoker who, with a few Fort Lauderdale investors, had begun developing the almost empty island. It was one of those investors who wanted a copy of the 1976 piece. Photographer Bob Ruff had accompanied Walker for a weekend as Smoker’s guest on this little island in the Abacos. They presented a portrait of the handful of residents, several from South Florida, who were living a very natural life on the island. It had only recently gotten electricity, and phone service was a novelty, but it did have a runway and a primitive harbor. That was Smoker’s concept. He wanted no commercial interests on the island, and over the years the growing homeowners association resisted efforts to build hotels and stores to attract tourists. We barely knew Smoker at the time, but he and his son, Ed, have since become well known for development in Fort Lauderdale. He told us that our 1976 story was a landmark in the history of Scotland Cay, and just last month he presented a copy of a new book that says as much. Scotland Cay: A short history of a small island is a hardback coffee table publication that traces Scotland Cay back to the 1600s when a few hardy souls farmed on the island. Their descendants are in the book, along with dozens of photos of more recent arrivals, many of who are highly visible South Floridians. The book is charmingly written by Laurence Coppedge, with contributions from a number of those who figured in the history of the place. Smoker, now 94, sent along a copy of the book with an expression of appreciation for the old magazine story. 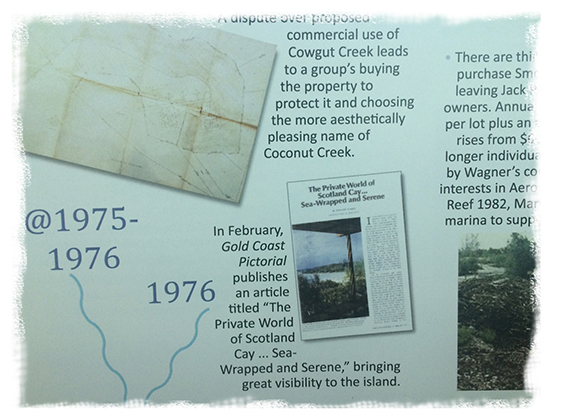 “Your article in the 1976 issue of Gold Coast regarding Scotland Cay brought me affluent European and American buyers. It was responsible for the growth and success of the island,” Smoker wrote. He added that in 1976 there were only five houses on the island; today there are more than 80. To our surprise and pleasure, the magazine article is included in the historical timeline covering several centuries, pictured above. It is good to know that somebody besides its publisher saved that story.